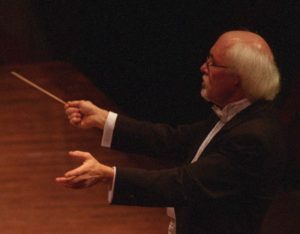 For the past 29 years, King has been the primary conductor of UVic’s highly praised Wind Symphony, but the maestro will put down his baton after the March 23 concert as he prepares to retire from UVic’s School of Music in June. And, fittingly enough, the program for this special concert includes pieces significant to both the Wind Symphony and to King himself. Clarinetist Patricia Kostek — who retired from the School of Music at the end of 2017 after 28 illustrious years at UVic — will return for this encore performance. As colleagues, the two have collaborated extensively (clarinet is also King’s instrument), so it was fitting to bring the piece back to the stage in March with Kostek. Other works on the program include Jack Stamp’s Gavorkna Fanfare — a nonsense title that King conducted in his very first concert with the Wind Symphony — as well as Lux Aurumque by Eric Whitacre, LOL by Robert Buckley, A Movement for Rosa by Mark Camphouse and others. 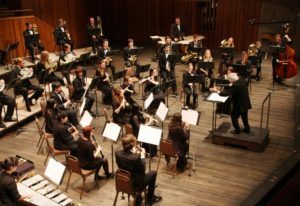 The UVic Wind Symphony is recognized as one of the premiere performing wind ensembles in the Pacific Northwest and among the finest university wind ensembles in Canada — and much of that credit goes to King’s expertise, commitment to the students, and his sometimes “tough-love” approach to teaching — as evidenced by the praises to Dr. King coming in on social media once word of his retirement got out. See below for even more reaction to Dr. King’s retirement. But King’s work with the Wind Symphony is but one of the many legacies he will leave behind. 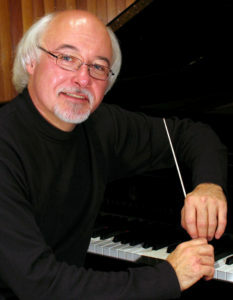 He started his teaching career at UVic 30 years ago in the Faculty of Education, and his appointment as conductor of the Wind Symphony in 1989 was the first of many stepping stones in his vision to see Music Education formally housed within the School of Music; this became a reality in 2014 following King’s two terms as Director of the School of Music. 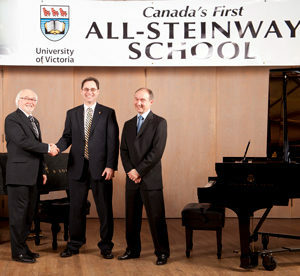 During his eight years as Director of the School of Music, King was also instrumental in UVic’s 2008 designation as Canada’s First and only All-Steinway School (a title which still stands today), leading the campaign to equip all Music classrooms, practice studios and concert halls with over 60 Steinway pianos. 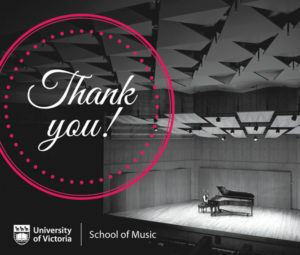 Given that Steinway pianos are known for their outstanding acoustical and performance properties, the opportunity to play on the best pianos in the world puts UVic students at a tremendous advantage. One final nod to the future is the establishment of the Dr. Gerald King Legacy Scholarship in Music Education. This new student award will see one or more scholarships awarded to academically outstanding undergraduate students in the Bachelor of Music (Music Education) program. Selection of the recipients will be made by the Senate Committee on Awards upon the recommendation of the School of Music. Please join us in contributing to this outstanding scholarship worthy of Dr. King’s years of service to the students and the university community. Donation cards will also be distributed at the March 23 concert. King describes his upcoming retirement as bittersweet. “I love the students and faculty that I’ve worked with over the years, but the new horizons are also very exciting,” he says. (Already on his calendar are numerous engagements for guest conducting, adjudicating, keynote speaking and working with graduate students at other institutions.) “The biggest change will just be my office,” he says with a chuckle. Don’t miss maestro King’s Finale concert with the UVic Wind Symphony on March 23 in the University Centre Farquhar Auditorium — sure to be a memorable evening! “I’m thankful to Gerry for modeling that a teacher’s job is to set a very high standard for our students while sharing our passion of music,” notes Jenn McVie-Britton.